Sovereignty is the ability of a player to claim ownership of the land around his or her city. If you have a Sovereignty claim on a square, it (1) prevents anyone else from settling there, (2) helps in the defense of your city, and (3) can increase the production rates in your city. Also, you are able to see hostile diplomats who are crossing your sovereignty square. If you have a level I sovereignty claim with no sovereignty structures on the square, then you can see the diplomats only over the sovereignty square. If you have a sovereignty square with a level V sovereignty claim and level V sovereignty structure, then the visibility range is a five square radius around that sovereignty square. Unless you're worried that a new city will pop up or settle right next to yours or you expect enemy armies to arrive at your city soon, you'll probably want to wait to claim Sovereignty until you've upgraded your farmyards (or other, relevant buildings) in your city to level 20. Sovereignty has an hourly cost to gain it's benefits, while basic buildings and resource plots don't, so it makes sense to upgrade them to level 20 first. The defensive benefits of sovereignty are: Occupying, Blockading and Sieging (hostile) armies receive a 1% penalty to their defense power when on a level I sovereignty square, a 2% penalty when on a level II sovereignty square, a 3% penalty when on a level III sovereignty square, a 4% penalty when on a level IV sovereignty square, and a 5% penalty when on a level V sovereignty square. To claim Sovereignty, you need to have researched (in order): Timekeeping, Bureaucracy, Pioneering, and Inventory Management (which requires a level 15 storehouse to research). At that point, you can build a level 1 warehouse, which allows you to research Sovereignty, which opens up the sovereignty research tree. Socage allows you to claim 20 sovereignty squares. Researching Fee-Farming (50 squares), Copyholding (75 squares), Burgage (100 squares), and Serjeanty (150 squares) allows you to claim more squares under Sovereignty. Landholding allows you to claim a level I sovereignty on a square. Tenancy allows a level II claim, Fiefdom allows a level III claim, Vassalage allows a level IV claim, and Feudalism allows a level V claim. Serfs allows you to build sovereignty structures on 3 squares that you have claimed sovereignty on. Peasants (6 structures), Thralls (10 structures), Lieges (15 structures), and Subjects (20 structures) allow you to build structures on more squares, but you can only build sovereignty structures on a maximum of 20 sovereignty squares. You will need at least Landholding and Socage researched before you can claim sovereignty. If you wish to build a sovereignty structure, you will need to research at least Serfs and the level I technology for the structure you wish to build. You must have a level I claim on a square before you can build a level I structure, and you must have the level I structure technology researched before that structure can be built. You will also need to have researched Militia, Stratagem, and Occupy Territory. You need at least 1 commander with 1 military unit under him. Click on the World Map and move your mouse over a square. Now look at the panel to the right of the map. This will tell you if anyone has already claimed sovereignty on the square, if sovereignty can be claimed on that square, and the benefits of claiming sovereignty on that square. Some squares can't be claimed with sovereignty, like squares with cities on them and impassable squares (like the Lake, Loch, Volcanic peak, Fiery mountain, Canyon, and Swampland tiles). You can have only one sovereignty structure on a square. In the above right example, Sarky receives a 6% bonus to his total farmyard production because of his level V farmstead on this square with 6 food. His Farmstead gives him a 1.2% boost to his total farmyard production per level of his Farmstead. If this square had a 3 beneath the food instead of a 6, then he'd get a 3% bonus to farmyard production with a level V Farmstead. If it was a 20 beneath the food, then it'd give a 20% bonus to farmyard production with a level V Farmstead. If King Sigurd had claimed sovereignty on that square instead of building his city there, and he built a level I Poleturner on it, his spear production time would be decreased by 6%. A level V Poleturner on that square would decrease his spear production time by 30%. The 1% bonus in the picture is 5%+1% for a 6% bonus per level of sovereignty structure. A square with a 2% production bonus would give a bonus of 7% for a level I structure and a 35% bonus for a level V structure. A 3% production bonus on a structure would give a 8% to 40% bonus to production times. Certain terrain types give certain bonuses. For example, a Rocky Outcrop tile always gives a +3% bonus to horse production when a Farrier structure is built on it. (This would be a 40% decrease in horse production time with a level V Farrier). You can find the full list of tiles with special bonuses near the end of this post. You can build any sovereignty structure that you have researched on any sovereignty square you have claimed as long as you're in your limit of total structures. If there is no special bonus for the structure on that square, you will receive a 5% bonus per level of the structure. Sovereignty structures can be upgraded to the same level as the Sovereignty level of the square it is on. The structures that boost your basic resource production require no hourly upkeep beyond that required for the sovereignty claim. You will see these bonuses applied under the City Map's side button for Resource Summary. Logging Camp - boosts lumberjack production. Requires the Logging research line. Earthworks - boosts clay pit production. Requires the Clay Firing research line. Mineshaft - boosts iron mine production. Requires the Square-Set Timbering research line. Gravel Pit - boosts quarry production. Requires the Soffolding research line. Farmstead - boosts farmyard production. Requires the Threshing research line. You will see the bonus for these structures applied on the Production page of the building that produces the advanced resource or unit. (The bonus for swords is seen next to where you queue up the production for swords, for example.) The upkeep cost is automatically removed so that your basic resource hourly production numbers will appear smaller. Cattle Rancher - decreases livestock production time. Requires the Droving research line. Bladesmith - decreases sword production time. Requires the Billetmaking research line. Farrier - decreases horse production time. Requires Stablehands research line. Bowyer - decreases bow production time. Requires Bowyer research line. Poleturner - decreases spear production time. Requires Poleturner research line. Bridlemaker - decreases saddle production time. Requires Saddle Trees research line. Armourer - decreases chainmail production time. Requires Coif Making research line. Papermill - decreases book production time. Requires Pulping research line. Brewer's Yard - decreases beer production time. Requires Malting research line. Engineering Yard - decreases siege block production time. Requires Wheelwrights research line. Training Ground - decreases spearmen production time. Requires Stamina Training research line. Target Range - decreases range troop production time. Requires Upper Body Conditioning line. Military Academy - decreases swordsmen production time. Requires Basic Training research line. Jousting Yard - decreases cavalry production time. Requires Jousting research line. Assembly Yard - decreases siege engine production time. Requires Welding research line. Finishing School - decreases diplomat production time. Requires Etiquette research line. How Much Will Sovereignty Cost Me? Claiming Sovereignty on a square has an hourly upkeep cost in research points and gold. 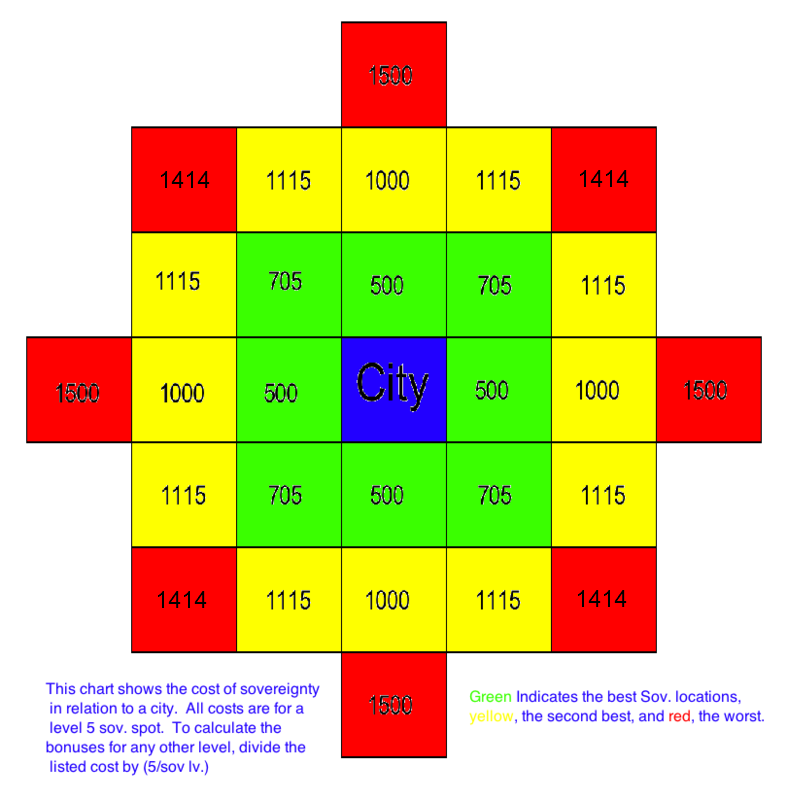 It costs the least to claim the squares immediately around your city to a depth of two squares. However, you choose which squares you want to claim--there aren't certain squares that you have to claim. These are the cheapest 20 squares to claim. To get all 20 squares to level V Sovereignty would cost 1,778 research points and 17,780 gold every hour. If your Library is upgraded to level 20 and you have a 25% tax rate, it produces 1,013 research points per hour. If you have the Allembine Research Discovery (from completing the Human Statue Mystery), you will produce an additional 100 research points every hour. So, basically, you can't claim 20 Sovereignty squares up to level V, even if you use this best configuration. Let's say that you have no sovereignty currently claimed, but there's a 13 food dolmen square at 6 squares away and one square over (or 6.08 distance). The squares directly around your city are 5 food squares. Is it worth claiming sovereignty that far away for the higher food bonus? So a level V Farmstead on the 13 food square will give a 13% bonus to your total farmyard production, but it will cost 304 research points and 3040 gold per hour. If you put a level V Farmstead on a 5 food square 1 square distance away (directly north, south, east, or west) from your city, it costs 50 research points and 500 gold per hour for each. Three of these Farmsteads would give you a 15% bonus to your total farmyard production and will cost a total of 150 research points and 1500 gold per hour. That's a higher total bonus for less than half the hourly cost. So it'd be better to build on the squares around your city. Let's say that you have sovereignty claimed on all 8 squares directly touching your city and all 4 squares that are 2 squares distance from your city. You can now claim a square 2 out and 1 over (2.24 distance) with 6 food or a square 3 out (3 distance) with a 12 food dolmen. Which is better for the cost? If you put a level V Farmstead on the 6 food square that is 2.24 square distance away from your city, it costs 112 research points & 1,120 gold per hour for a 6% farmyard production bonus. If you put a level V Farmstead on the 12 food square that is 3 square distance away from your city, it costs 150 research points & 1,500 gold per hour for a 12% farmyard production bonus. In this case, the 3 distance square gives more benefit for the cost. You have a 5 farmyard city with each farmyard at level 20, the flourmill at level 20, the 8% Nature's Bounty spell cast on the city, and a 25% tax rate. You're hoping to maximize your population. As I say in my Sovereignty Made Simple guide, you'll need about a 109.6% bonus from sovereignty to your food output. Just to make this example easier to understand, we'll assume you can handle the cost of claiming 20 squares with level V Farmsteads on them. If every one of those squares were 5 food (and so gave a 5% bonus), then you'd receive a 100% bonus to your total farmyard production. That's pretty good, but it restricts either your population or your ability to raise your taxes and you can't use your sovereignty for anything else. What if you had a 15 food dolmen on one of those 20 squares? Then you'd have a 110% bonus to your total farmyard production. You can maximize your population, but your taxes can't be raised. What if you had a 15 food dolmen and a 17 food dolmen? You'd have a 122% bonus. Now you have some flexibility. What if you have 10 squares with 5 food, 6 squares with 6 food, and 4 squares with 7 food on them? You'd have a 114% food bonus. Again, you'd have a little bit of flexibility. Keep in mind that you can't easily raise all 20 squares to level V sovereignty at this time (even if you claim only the cheapest squares) due to lack of enough research points. Raising taxes only decreases your research point production and makes this harder. These examples show that there are several ways to make 5 food cities produce enough food for high populations. But it's either high population or high taxes, not both, and you'll need to claim 20 squares of sovereignty that will almost totally be used for Farmsteads. In contrast, a 7 farmyard city with each farmyard at level 20, the flourmill at level 20, the 8% Nature's Bounty spell cast on the city, and a 25% tax rate could produce as much food as the above 5 farmyard examples but with only 8 (or less) sovereignty squares with level V Farmyards on them. What about the Chancery of Estates? The Chancery of Estates decreases the research point and gold cost of claiming level I Sovereignty by 2% per level--that's 40% at level 20. Two of these buildings would give a 60% decrease if both were at level 20. This building allows you to claim more Sovereignty squares than you could without it. At this time, any squares above the 20 that can take Sovereignty structures are basically only giving you a land claim. This building can save you gold that can be used for other purposes. It can also allow a player to build slightly higher Sovereignty structures than they might otherwise be able to due to their tax rate (which decreases research points) or the distance of the square claimed. Normally, the cost of a Sovereignty level I claim on a square that is 1 square distance away would be 10 research points and 100 gold. Level II would be 20 research points and 200 gold, Level III would be 30 research points and 300 gold, Level IV would be 40 research points and 400 gold, and Level V would be 50 research points and 500 gold. With one Chancery of Estates at level 20, a level I claim at 1 distance would be 6 research points and 60 gold. Level II would be 16 research points and 160 gold, Level III would be 26 research points and 260 gold, Level IV would be 36 research points and 360 gold, and Level V would be 46 research points and 460 gold. Once the army is Occupying the square, click on the army on the World Map and select Claim Sovereignty from the menu. You will be taken to the Sovereignty page (which is a side button of the City Map menu button). This page will tell you if another town holds sovereignty on the square or if it's unclaimed. It gives the coordinates and distance of the square, the level already claimed (and the % completed if you are increasing or decreasing your Sovereignty level on the square), claim status (rising, balanced, or decreasing), the total hourly cost in gold and research points to maintain this claim, and the time it will take to complete your sovereignty claim. You have begun claiming Sovereignty I at this location. This square had no pre-existing Sovereignty Claim. Your claim - if uncontested - will finish on or around 05OCT11 04:12. To view the information for or interact with your Sovereignty claims, move your mouse over the City Map menu button and click on the Sovereignty side button. It will show a list of your Sovereignty claims by listing the coordinates, Sovereignty level, and structures present. After you start the claim, the Sovereignty page will show all of the previous information plus the specific Sovereignty bonuses for that square, the upkeep costs for any sovereignty structures on that square, the resource cost to build the various Sovereignty structures, and any hourly upkeep costs for each structure. You can build any building that you have the research completed for. Finally, at the bottom is a Cancel Sovereignty button and the time it will take to lose a level of sovereignty if you no longer want Sovereignty over that square. When your Sovereignty claim is "Balanced" (which means you've finished claiming that level of Sovereignty and it is neither rising or descreasing), you will also have the option to Claim Sovereignty from this page. It tells you how long it will take to claim that sovereignty, but the number given is twice as long as it will actually take. You must place an Occupying army on the square to claim more sovereignty ("You can only claim Sovereignty on a square at which you have an Army present."). When an Occupying army is present on the square, you will notice that the time to claim sovereignty if half that given when there is no army on the square. The amount of time you leave the army on the square doesn't effect how long it takes to claim it. You must claim one level of Sovereignty before you can start your claim for the next level of Sovereignty. To claim the next level of Sovereignty, send your army to Occupy the desire square. Once the Occupying army arrives, you can claim sovereignty like before--by going to the World Map and clicking on the army--or by going to your Sovereignty page, selecting the correct Sovereignty claim from the list, and clicking the Claim Sovereignty button. Once you have a balanced Sovereignty claim on a square, you can select a Sovereignty structure from the list of structures you have researched and click the Build Structure button. This will not take up a building queue in the city but is built separately. You are told that the structure is being built and you will receive a system mail when the structure has been completed. Once the structure is completed, it's bonus will start. In the list of Sovereignty claims, the bar for each claim will list what structure is being built or is on the square and what bonus it will give. Once a structure is selected and built, you can only increase or decrease the level of that same structure. You can have only one Sovereignty structure on a square, but you have the option to demolish an existing Structure level by level until you reach 0. Then you can build a different structure there. The amount of time it takes to demolish a structure is much less than it takes to build that same level of structure. You are about to cancel a Sovereign claim over a square. Cancelling Sovereignty will instantly remove the cost of maintaining Sovereignty, as well as any Sovereign Structure bonuses you might be receiving from this square. Sovereignty over this square will continue to fall until you put an Army back on the square and claim Sovereignty again. If you're sure you wish to continue, press the Cancel Claim button below. If you click the Cancel Claim button, the claim will continue to decrease until all claim is lost unless you put an Occupying army back on the square when it's at the desired level. You must watch to see when the claim reaches the desired level since you won't receive a system mail telling you when a lower level has been reached. If you capture a city using Siege, the Sovereignty for that city should transfer to the new owner of the city. A player can also send his army to Occupy the Sovereignty square of another player and Claim Sovereignty on that square. The army must remain there long enough for the sovereignty level to decrease to 0 for the other player, then the claim for the current player starts to rise and the army may be removed. I've seen many players claiming sovereignty on far away squares simply because those squares have a bonus, so I thought I'd add a section with cost/benefit charts. You can build any sovereignty structure on any sovereignty square (as long as you have the research for it done and you have less than 20 sovereignty structures already built). For sovereignty structures that give a bonus to production rates, if a special bonus isn't mentioned, then the square gives you a 5% production speed bonus per sovereignty structure level. So the cost per benefit charts show that it isn't worth claiming a 6% bonus square at a greater than 2 squares away and 1 over distance instead of a square that's less than that distance with no special bonus for that structure. So the cost per benefit charts show that it isn't worth claiming a 7% bonus square at a greater than 3 squares away distance instead of a square that's less than that distance with no special bonus for that structure. So the cost per benefit charts show that it isn't worth claiming a 8% bonus square at a greater than 3 squares away and 1 over distance instead of a square that's less than that distance with no special bonus for that structure. How to use the cost-benefit charts: Build on the most cost-efficient squares and then on the next most cost-efficient squares and so on. It works out in the above charts that it will be most cost-efficient to build on the four squares that are 1 square distance from your city first. But then--if you plan to build the structure with the special bonus--an 8% bonus square that's 2 squares distance is better to claim next (at 25 gold per 1% benefit) than a 5% bonus square that's 1 square away and 1 over (at 28.2 gold per 1% benefit). Otherwise, you'd claim the 1 square away and 1 over square next. To put it another way, if you wish to claim an 8% bonus square that's 3 squares away and 1 over, it'll cost you 158 research points and 1580 gold per hour to have a level V sovereignty and the 40% bonus from the square. If you built this structure on two general 5% bonus squares that are 1 distance from your city, you'd get a total of a 50% bonus for 100 research points and 1,000 gold. So more benefit for less cost. If you built this structure on one general 5% bonus square that is 2 squares away and 1 over distance from your city, you'd get a 25% bonus for 112 research points and 1,120 gold. So it'd cost less per benefit to build that structure on the specialized square that's 3 squares away and 1 over. Of course, usually you're not going to build production-boosting structures on all of your sovereignty squares since they also have an hourly cost in wood, clay, iron, and stone. The above mainly just shows that it is not cost effective to build production-boosting buildings on squares further away than 3 squares away and 1 over--even if those distant squares have high bonuses. So you should claim sovereignty on a 21 food square that's 9 squares away (cost of 214.29 gold per 1% benefit)? As previously mentioned, you'd want to build on all the "cheaper" squares first, which means all the squares up to 2 squares distance away, then any 6% or 7% bonus squares that are 2 squares away and 1 square over. And then any 7% bonus squares that are 2 squares away and 2 over or 3 squares away. To put it another way, to claim level V sovereignty on that 21 food square that's 9 squares away, it'd cost you 450 research and 4,500 gold per hour. Compare that to four 5 food squares that are 1 square distance away, which would give you a total bonus of 20% for a total hourly cost of 200 research points and 2000 gold. Or compare it to four 5 food squares that are 2 square distance away, which would give you a total bonus of 20% for a total hourly cost of 400 research points and 4,000 gold. As you can see, you can usually claim several closer squares for less cost and the same benefit as one very high benefit square that's far away. If you really want that high-bonus square as sovereignty, settle close to it so you can actually benefit from it. In general, I'd suggest not claiming sovereignty further than 4 squares away from your city even when the bonus looks wonderful. Once you've claimed all the more cost-efficient squares first, you probably don't have enough research points left to claim a square further away than that, anyway. Information for this Guide came from personal experience, help from my wonderful VIC alliance mates, and the information provided by the developers and compiled by Manannan. Special thanks to my alliance mates. Ok, this will take me a few weeks to digest. Most impressive, MZ. I know this will be a long lasting player tool. You have done wonders, once again. Thank you, this will greatly help me and every player in Illyriad. Thank you TD, GreatDane, and Gilthoniel. I'm always glad to know that people find my guides helpful. I'm a bit confused here... Does the Chancery reduce the cost of higher level claims, or only the first level? It reduces the cost of the first level, and that "savings" carries over into the TOTAL cost of each additional level. Think of sov as a stack of shoeboxes. Each shoebox costs 100 gold and 10 rp. The Chancery reduces the cost of the first "shoebox" by up to 40% (regardless of how many shoeboxes you buy) but does not affect any of the other shoeboxes in the stack. Will anybody discuss which squares are the best for claiming Souvereignty or generally about the claiming strategy? Yes, I know about the Food 20 squares or close, but what else? I'm a new player, and it's VERY important for me to know where is the "bottleneck" in the army building? What's better - the resource bonus (like +20% iron), +40% to Plate armor production or +35% to infantry production? Or I should build an empire with all bonuses for the chain (resources, weapon/armor and infantry/cavalry/diplo)? Ector, I think no one discusses it because this is an area where playstyles determine what is valuable to the player. For example, if you're a human who wants a big knight army, then sov that have bonuses for knight production or the production of equipment needed to produce knights would be valuable.If you want to be a merchant, finding sov that speed up production of high-price items on the market would be valuable. If you plan on putting 3 advanced buildings in that all have a high hourly cost in clay, for example, then a square with a high clay bonus would be useful. The bottleneck in army building... Hmm. Well, when you start building an army, the bottleneck is usually in producing enough of the advanced goods. At little later, it's usually in having enough gold to sustain the army. If you're being attacked and you have a stockpile of the needed equipment, then it would be in the production time. This is why it's nice you can change structures on the sov squares.